1 Posgrado en Botánica, Colegio de Postgraduados, Montecillo, Texcoco, Estado de México, México. 2 Microbiología, Edafología, Colegio de Postgraduados, Montecillo, Texcoco, Estado de México, México. 3 Posgrado en Ciencias Forestales, Colegio de Postgraduados, Montecillo, Texcoco, Estado de México, México. 4 Departamento de Biotecnología y Bioingeniería, CINVESTAV, Instituto Politécnico Nacional, San Pedro Zacatenco, México. All of the Pinaceae require the ectomycorrhizal interaction to survive under field conditions. However, their use has not traditionally been considered in the production of forest plants in Neotropical areas. There will be an increase in plant quality in greenhouse and in survival in the field of Pinus pringlei inoculated with ectomycorrhizal fungi (ECMF). The experiment was carried out in Texcoco, Mexico, in two sites: i) greenhouse of the Colegio de Postgraduados; and ii) in the field, in the San Pablo Ixayoc town. P. pringlei plants, a native species of Mexico, were inoculated with the ECMF: i) Hebeloma alpinum (Ha); ii) Laccaria trichodermophora (Lt); and iii) Thelephora terrestris (Tt). The effect of this inoculation on plant growth and nutritient translocation was evaluated. A morphological and molecular characterization of ectomycorrhizal roots and an evaluation of the seedling field survival were carried out, and compared with non-inoculated plants. Pinus pringlei plants inoculated with ECMF increased their growth and nutrient content. A significant nutritional allocation from root to stem mainly of K, Fe, and Zn was recorded. The morpho-anatomical and molecular characterization showed the presence of Ha, Lt and Tt in ectomycorrhizal roots. Two-year old plants mainly inoculated with Ha and Tt showed higher survival in the field than non-inoculated plants. The beneficial effects of ECMF on P. pringlei growth, nutrimental translocation (mainly on K, Fe and Zn), and field survival rates are reported for the first time. Todas las pináceas requieren de manera obligada para sobrevivir en condiciones de campo de la interacción ectomicorrízica. Sin embargo, ésta no ha sido considerada tradicionalmente en la producción de plantas forestales en áreas Neotropicales. Ocurrirá un incremento en la calidad de las plantas de P. pringlei en invernadero y en su supervivencia en campo si son inoculadas con hongos ectomicorrízicos (HECM). El experimento se llevó a cabo en Texcoco, México en dos sitios: i) invernadero del Colegio de Postgraduados y ii) en campo, en un terreno en la comunidad de San Pablo Ixayoc. Se inocularon plantas de P. pringlei, una especie nativa de México con los HECM: i) Hebeloma alpinum (Ha), ii) Laccaria trichodermophora (Lt) y iii) Thelephora terrestris (Tt). Se evaluó el efecto de dicha inoculación en el crecimiento y translocación nutrimental vegetal. Se efectuó una caracterización morfológica y molecular de las raíces ectomicorrizadas y se evaluó la supervivencia de las plantas trasplantadas a campo. Las plantas de P. pringlei inoculadas con los tres HECM presentaron incrementos en términos de crecimiento y contenido nutrimental. Se registró una traslocación nutrimental significativa de las raíces a los vástagos, principalmente de K, Fe y Zn. La caracterización morfo-anatómica y molecular demostró la presencia de Ha, Lt y Tt en las raíces ectomicorrizadas. Las plantas inoculadas principalmente con Ha y Tt presentaron mayor supervivencia en condiciones de campo comparado con las plantas no inoculadas. Se reporta por primera ocasión el efecto benéfico de los HECM en el crecimiento, translocación nutrimental (principalmente de K, Fe y Zn) e incremento en las tasas de supervivencia en campo en P. pringlei. Forests provide environmental services such as groundwater recharge, conservation of biodiversity, and capture of greenhouse gases. In addition, they contribute to human welfare by providing food, medicine, subsistence materials, and recreation, mainly in the rural areas worldwide. One-third of the land area in the planet is covered by forests (about 3,999 million ha). However, due to human population growth and land use change, currently, forest masses have declined more than 50 % during the last 25 years, particularly in the tropics of America and Africa (FAO 2016). In Mexico, 755,000 ha of temperate and tropical forests were lost during the period comprised from 2005 to 2010 (FAO 2010). Ectomycorrhizal interaction has a paramount importance from the structural, ecological, and functional point of view in forest systems (Siddiqui & Kataoka 2011). This relationship is established between the roots of trees and shrubs belonging mainly to Pinaceae, Cupressaceae, Fagaceae, Betulaceae and Salicaceae families (Smith & Read 2008) and more than 20,000 species of fungi mainly Basidiomycetes and Ascomycetes (known as ectomycorrhizal fungi-ECMF) (Comandini et al. 2012). One of the benefits of the ectomycorrhizal interaction is the nutritional exchange between the fungi and their host plant; it has been estimated that the ECMF receive from the host plant around 20 to 25 % of the total production of their photosynthetic compounds (Hobbie 2006), in exchange the associated plants increase their nutrient uptake, mainly P, and N, which brings as a consequence a reduction of transplant stress and an increase of field survival (Parladé et al. 2004, Rincón et al. 2007). 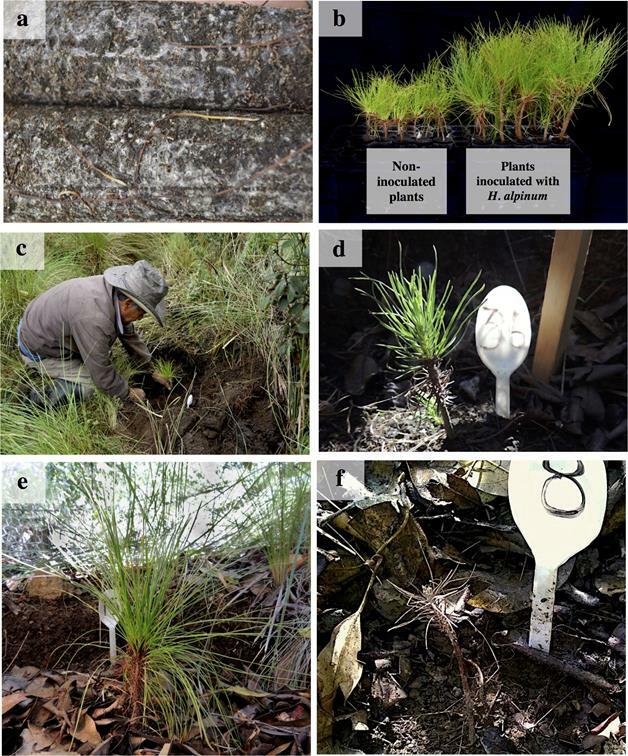 In addition, it has been demonstrated that reforestation of pine seedlings inoculated with ECMF significantly enhance their survival, growth, and nutrient uptake under field conditions, including areas with mine tailings (Zong et al. 2015); post-fire conditions (Franco et al. 2014); and calcareous (Rincón et al. 2007) and degraded soils (Gómez-Romero et al. 2013). Therefore, the ectomycorrhizal inoculation is considered a practice that mitigates stress factors and increases seedling performance under field conditions. Several ECMF have also great added value as a non-timber forest product due to their edibility; and high price in the international markets (Yun & Hall 2004). The inoculated fungi were selected because they: belong to genera which contain pioneer species (Obase et al. 2007, 2012), are frequently associated with seedlings in greenhouse (Obase et al. 2012), tolerate low-fertility conditions (Trocha et al. 2007) and establish ectomycorrhizae with a wide range of host plants (Cairney & Chambers 2013). Additionally, Laccaria trichodermophora G. M. Muell. (Montoya et al. 2014) and Hebeloma alpinum (J. Favre) Bruchet (Carrasco-Hernández et al. 2011) are edible mushrooms widely consumed in Central Mexico. A strategy used for the restoration of Mexican forests is the reforestation, and only a small number of pine species, i.e., Pinus greggii Engelm. ex Parl., Pinus patula Schltdl. & Cham., and Pinus montezumae Lamb. have been used. However, there has historically been a low survival rate of transplanted trees in the field in reforestation programs which could be as low as 10 % (Sáenz-Romero 2003, Orozco-Gutiérrez et al. 2010, CONAFOR 2014). One of the reasons for these high plant mortalities is the lack of inoculation with ECMF in the nursery plant production in Mexico (Pérez-Moreno & Martínez-Reyes 2014). Mexico is the second center of diversification of the genus Pinus with 49 species out of the 120 registered worldwide, among which 55 % are endemic (Sánchez-González 2008, Gernandt & Pérez-de la Rosa 2014). Currently, native Pinus species have gained a lot of interest and have gradually been incorporated into reforestation programs, because they are better adapted to native conditions and many of them are in danger of extinction (Farjon 2013). Pinus pringlei is a threatened native species of Mexico, because of its limited distribution in small parts of the states of Michoacán, Guerrero, Oaxaca, Puebla, State of Mexico, and Tlaxcala. Traditionally it is known as cedrón, ocote, red pine, and escobetón (Villaseñor et al. 2013). This species has not had a massive timber harvesting. However, it has a high potential due to the great quality of its wood and resin, as well as the wood color (López-Upton et al. 2001, Sotomayor-Castellanos & Ramírez-Pérez 2014). Additionally, it has medicinal properties to relieve asthma, pneumonia and cough. In general terms, the biotechnological use of native ECMF in association with Neotropical pines has also been scarcely explored in both nursery and field conditions. Given that, in general, ectomycorrhizal inoculation increase growth and nutrient uptake of the plants, we hypothesized that seedlings of P. pringlei growing with ECMF will increase the growth and nutrient uptake under greenhouse conditions and will enhance the seedling performance under field conditions compared with seedlings without ectomycorrhizal fungi. Therefore, the present study was developed with the objective of evaluating the effect of fungal inoculation on growth, nutrient content and allocation, mycorrhizal colonization in greenhouse and survival in the field of Pinus pringlei. The present study included two independent bioassays, one established in greenhouse and one in the field. Greenhouse experiment. Biological material and set-up of experiment. Seeds of a single Pinus pringlei tree were used because there were few mature individuals, due to the fragmented distribution of this species. These seeds were collected in Santa Catarina Estetla, Municipality of Santa María Peñoles, State of Oaxaca, Mexico. Sporomes of the wild native edible fungi Hebeloma alpinum (J. Favre) Bruchet (Ha) and Laccaria trichodermophora G.M. Muell. (Lt) collected in the pine forests nearby Ozumba City, State of Mexico, were used. The inoculum of Ha and Lt was prepared from pilea dehydrated at 35 ºC for 48 h and afterwards ground. The inoculum was stored at 5 ºC until its use. In the case of Thelephora terrestris Ehrh. (Tt), substrate previously infected with sporomes of this fungus was used. This fungus was previously collected in the forests of San Pablo Ixayoc town, Texcoco, State of Mexico. P. pringlei seeds were sterilized with 30 % H2O2 for 20 minutes and rinsed four times with sterile distilled water. The substrate used to sow these seeds consisted of a mixture of sand, bark and forest soil, in a 2:2:1 ratio, which was sterilized with steam for three hours, then after 24 hours the process was repeated (Martínez-Reyes et al. 2012). Seeds were sown in plastic containers with a volume of 130 cm3, previously disinfected with alcohol, and filled with the substrate mentioned above. Fifteen containers were used per treatment, in each one three seeds were sown at a depth of 0.5 cm. Once the seedlings emerged, around 21 days after sowing, only one plant was left to grow per container, in order to reduce the experimental error, by having homogeneous plants in terms of height and stem diameter, in the whole experiment. Inoculation was carried out at the time of sowing with 106 to 108 spores per plant in the case of Ha and Lt, and 5 g of colonized substrate in the case of Tt. A parallel set of containers where seeds were not inoculated was also set up and used as control. Non-inoculated and inoculated plants were kept in greenhouse conditions during 390 days. Experimental design. An unifactorial completely randomized experimental design was used, with four treatments and 15 replicates per treatment, having a total of 60 experimental units. The treatments consisted in inoculating Pinus pringlei with: i) Ha; ii) Lt and iii) Tt. The fourth treatment consisted of a control of non-inoculated plants. Analysis of nutrients in plant tissue.- Nutrient analyses were performed on the shoot and roots of the five plants used previously for dry weight evaluation in each treatment. N was determined by wet digestion (Bremner 1965); total P determination, followed the method of Allen et al. (1997); K was measured by extraction with ammonium acetate by flame photometry, and Ca, Mg, Fe, Cu, Zn, Mn and B by extraction with ammonium acetate and photocolorimetry with azomethine. Shoot:root nutritional relations.- An analyses of the ratio of nutrient content between shoots and roots was carried out to compare inoculated plants versus non-inoculated plants in order to know the nutritional translocation efficiency measured by ectomycorrhizal fungi, not only to the root, but also to the shoot. These analyses were carried out in all of the evaluated nutrients. According to these relationships, values greater than one indicate greater nutrient translocation efficiency (Rentería-Chávez et al. 2017). Mycorrhizal colonization and macro- and micromorphological characterization of ectomycorrhizae. A destructive random sampling of five plants per treatment, 20 plants in total, was carried out to evaluate the mycorrhization. As this evaluation is destructive, and it affects the root dry biomass, the plants used to measure this response variable were different than those used to evaluate shoot and root dry weight. Root systems were cut from the shoots and they were soaked during 24 h in water, then washed with water under pressure, using three sieves of different diameters (1.19, 0.180 y 0.085 mm) to collect as many roots as possible. The total number of mycorrhizal, non-mycorrhizal and dead roots was quantified by using a stereoscopic microscope Leica MZ6 to estimate the percentage of ectomycorrhizal colonization (Marx et al. 1994). The percentage of colonization was obtained by calculating the proportion of mycorrhizal short roots in relation to the total number of short roots for each plant. Short roots were considered ectomycorrhizal when they presented the diagnostic structures of the symbiosis: mantle, Hartig net and external mycelium. Hand cuts were also made for micromorphological analysis and photographs of the mycorrhizal roots were taken with an Olympus BX51 optical microscope. In addition, a morphoanatomical description of mycorrhizal morphotypes was carried out describing the length, diameter, color, type of branching, presence of rhizomorphs and type of external mycelial exploration (DEEMY 2017). Molecular analysis. To verify that ECMF inoculated at the beginning of the experiment, where the same than those established in the roots of Pinus pringlei after 390 days, molecular identification of characteristic morphotypes of each species, extracted from 5 plants for each inoculated treatment, was carried out. The DNA was isolated from tips of ectomycorrhizal roots, using 200 mg milled in liquid nitrogen. DNA was extracted with Power Soil® DNA Isolation kit (Mo Bio, catalog number 12888-50) and stored at -20 ºC. The region of the ribosomal internal transcribed spacer (ITS) was amplified by PCR, using the combination of primers ITS4 and ITS5. The procedure used for PCR amplification was: five minutes of initial denaturation at 94 ºC, followed by 30 cycles (30 seconds at 94 ºC, 30 seconds at 55 ºC and 45 seconds at 72 ºC), with a final extension of 72 ºC for five minutes. PCR products were cleaned with ExoSAP-IT (USB Corporation) and subjected to the sequencing reaction with BigDye V3.1. The DNA sequences were obtained by 3130xl Genetic Analyzer sequencer. The taxonomic identity of the mycorrhizal morphotypes was determined by the phylogenetic affinity of their consensus sequences when they were compared with the GenBank databases using the BLAST program. Statistical analysis. For each response variable an analysis of variance (ANOVA) and a Tukey (P ≤ 0.05) test of comparison of means, using SAS® version 9.2 (2009) was performed. Prior to these analyses, the assumptions of independence, normality and homogeneity of variances for each of the evaluated variables were verified with SAS® and when they fail to comply, logarithmic and square root transformations were applied to the variables with SAS®. A Pearson correlation analysis was performed to determine if there was a relationship between nutrients in mycorrhizal and non-mycorrhizal plants. Field experiment. Selection of mycorrhizal plants. For the field experiment, 160 trees were produced using the same methods described in the greenhouse bioassay. These plants were kept during 390 days in greenhouse and after that time, 40 trees with the highest ectomycorrhizal colonization percentage were selected for the field bioassay. Previously to its establishment in the field, an evaluation of the percentage of mycorrhizal colonization was carried out under a non-destructive method in order to avoid a strong damage the root system of the plants. The ectomycorrhizal colonization was estimated with the same methods described for the greenhouse experiment. This method consisted of analyzing 7 root fragments of 5 cm randomly extracted from the root system for each plant of each treatment. Only plants with 95 % of mycorrhizal colonization or more were choosen to be transplanted to the field. This evaluation was made two weeks before the transplantion. Experimental design and establishment of experiment. The experimental design has a completely randomized arrangement with 10 plants per treatment having therefore a total of 40 experimental units, including non-inoculated plants. The four evaluated treatments included plants inoculated with Ha, Lt and Tt, and an additional treatment of non-inoculated plants. On September 28, 2015, 425 days after sowing, in a field located at San Pablo Ixayoc, Municipality of Texcoco, State of Mexico at 2 500 m a.s.l., 19º 26’ 49.07’’ N and 98º 46’ 11.49’’ W. The square 40 × 40 m in the field, without slope in which trees were transplanted, had not been used during the last 40 years. Plants were distributed in an equilateral triangle arrangement at a distance of 4 m between each tree. Every two months during one year, plant survival was recorded. Therefore, the total age of plants at the end of the field evaluation was 26 months, which was also the total duration of the experiment. Variable evaluated in the field. Every two months during one year, the dead plants of each treatment were counted in order to determine the percentage of survival. Statistical analysis. Survival differences between treatments were assessed by the Log-Rank test, taking in account the survival based on Kaplan-Meier method using the IBM SPSS Statistics® software version 24.0 (2016). Greenhouse experiment. Height, stem diameter and dry weight. Independently of the inoculated ECMF, there was significantly (P ≤ 0.05), greater height (df = 59; F = 0.0001) and stem diameter (df = 59; F = 0.0001); and shoot (df= 19; F = 0.0001), root (df = 19; F = 0.0005) and total dry weight (df = 19; F = 0.0001) in inoculated plants compared to non-inoculated plants. The ratio between shoot and root in plants inoculated with Ha, Lt and Tt was 1.4,1.2 and 1.2, respectively. This relationship was much higher compared to that shown in non-inoculated plants where that value was 0.5 (Table 1). According to the Dickson Quality Index (Dickson et al. 1960), plants inoculated with any of the three inoculated ECMF had better (P ≤ 0.05) plant quality than non-inoculated plants (df = 19; F = 0.0001); with the values being 2.4, 2.2 and 2.1 for plants inoculated with Tt, Lt and Ha, respectively and 0.3 for non-inoculated plants. Table 1 Dry weight, height and stem diameter of Pinus pringlei plants, 390 days after sowing, inoculated with three ectomycorrhizal fungi and non-inoculated. Values are untransformed means ± standard error, n = 5 for dry weight; and n = 15 for shoot height and stem diameter. Different letter in the same column indicate statistically significant differences among the treatments according to Tukey’s test (P ≤ 0.05). Nutrient content. Macronutrients.- Macronutrient content was higher in plants inoculated with any of the three ECMF; in shoots, roots and total amounts compared to non-inoculated plants (Table 2). The nutrients found in higher proportions in inoculated plants compared to non-inoculated plants in the shoots were K, N and P. Similarly, in the roots the nutrients registered in greater proportions were Ca, P and N. Among the three inoculated ECMF, the greatest increase in total contents in relation to non-inoculated plants was recorded in Tt; in the contents of K, N, P and Ca, being 7.8, 6.4. 6.0 and 5.3, respectively times higher compared with non-inoculated plants. Meanwhile plants inoculated with Lt have 4.8 times higher Mg content than non-inoculated plants. Table 2 Macro-nutrient contents of Pinus pringlei, inoculated or not, with three ectomycorrhizal fungi, 390 days after sowing. Values are untransformed means ± standard error, n =5. Different letter in the same line indicate statistically significant differences among the treatments according to Tukey’s test (P ≤ 0.05). Micronutrients.- Plants inoculated with any of the three ECMF showed higher micronutrient content, in shoots, roots and total amounts, compared to non-inoculated plants (Table 3). The nutrients found in higher proportions in inoculated plants compared to non-inoculated plants in the shoot were Fe and Cu. Meanwhile in the roots, the nutrients in greater proportions were Cu and Mn. The plants inoculated with Ha showed higher levels of Cu and Zn in the roots and total amounts compared to the plants inoculated with Tt and the non-inoculated plants. The inoculated plants with Lt showed higher Fe content in the shoot and Mn in the root compared to plants inoculated with Ha and non-inoculated plants. Plants inoculated with Tt presented higher Mn content in the shoot and total contents, and also higher Fe and B in the roots and total contents, compared to plants inoculated with Lt and non-inoculated plants (Table 3). Pearson correlation between the plant content of a number of macro and micronutrients was strongly positive (r = 1.00, P < 0.001). Total positive correlations were recorded more frequently in mycorrhizal plants than in non-mycorrhizal plants (Suplementary material). For example, independently of the inoculated mycobiont, in ectomycorrhizal plants there was a positive correlation between the content of the N and K of the stem with the content of most of the evaluated nutrients, which was highly significant with the Ca and Mg content of the stem (r = 1.00, P < 0.001). Plants inoculated with Tt showed more frequently total positive linear correlations between nutrient contents than those inoculated with Ha and Lt. In contrast, in non-mycorrhizal plants, there were only strongly possitively correlations in some cases, such as root Mg with root Ca; and shoot Zn with shoot B (r = 1.00, P < 0.001). Table 3 Micro-nutrient contents of Pinus pringlei, inoculated or not, with three ectomycorrhizal fungi, 390 days after sowing. Values are untransformed means ± standard error, n = 5. Different letter in the same line indicate statistically significant differences among the treatments according to Tukey’s test (P ≤ 0.05). Shoot: root nutritional relations. In inoculated plants there was a mobilization of macronutrients from roots to shoots, by any of the three ECMF. However, the greatest transfer was recorded in: i) K in inoculated plants with any of the three ECMF; and ii) Mg in inoculated plants with Ha (Table 4). The same effect was observed with Fe and Zn micronutrients by any of the three evaluated fungi. However, Fe was mobilized mainly by Lt. Tt made a mobilization of all of the micronutrients; in contrast in the case of Cu and Mn none of the other two fungi were able to mobilize them to the shoots (Table 4). Table 4 Shoot: root growth and nutritional relation of Pinus pringlei plants, 390 days after sowing, inoculated or not with three ectomycorrhizal fungi. Mycorrhizal colonization. The percentage of mycorrhizal colonization was higher independently of the inoculated ECMF, with values of 96, 97 and 97 % in inoculated plants with Ha, Lt and Tt respectively. While all non-inoculated plants remained non-mycorrhizal. Independently of the mycobiont, a greater number (P ≤ 0.05) of mycorrhizal roots (df = 19; F = 0.0001) and total roots (df = 19; F = 0.0004) was recorded in inoculated plants in relation to non-inoculated plants. Inoculated plants with Tt showed a significantly higher number of mycorrhizal and total roots compared to inoculated plants with Ha (Table 5). Table 5 Number of mycorrhizal, non-mycorrhizal and dead roots of Pinus pringlei, 390 days after sowing, inoculated or not with three ectomycorrhizal fungi. Values are untransformed means ± standard error, n = 5. Different letter in the same column indicate statistically significant differences among the treatments according to Tukey’s test (P ≤ 0.05). Macro- and micromorphological characterization of ectomycorrhizal. Hebeloma alpinum.- The ramification type was absent or dichotomous, cylindrical, 1 to 5 mm long and 0.2 to 1 mm in diameter. The unbranched tips were straight with cylindrical or narrow ends. In their juvenile stages they had a surface brown or white in color, with the base darker and the tip whitish; in its mature stage, the ectomycorrhizal turned dark brown and was covered by white hyphae. The mantle presented good visibility, the texture of the surface was smooth and silver in color, densely cottony. There were abundant emanating hyphae, white to cream or whitish, without a distribution pattern due to the fact that they covered the entire mycorrhizal root. The type of exploration mantle was of short distance according to Agerer (2001). Rhizomorphs and sclerotia were absent. The external and internal anatomy of the mantle was plectenchymatous. The emanating hyphae were slightly wavy, without constriction in the septum and were arranged at considerable distances. The cortical cells in the transverse section were cylindrical. The Hartig net was extended to the first three rows cells, without reaching the endodermis (Figure 1a-d). Figure 1 Ectomycorrhizae of Pinus pringlei with Hebeloma alpinum (Ha) and Laccaria trichodermophora (Lt). 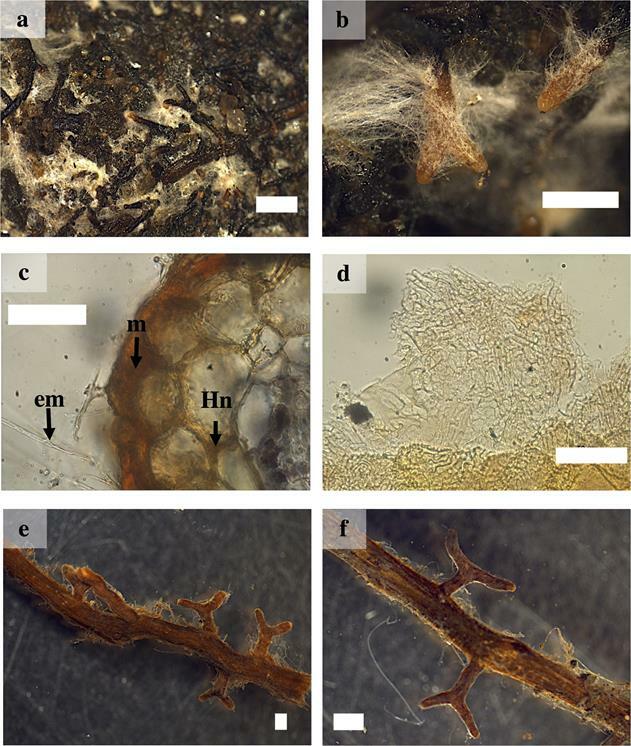 a) and b) ectomycorrhizal roots with Ha showing abundant external mycelium and close-up; c) cross-section of the ectomycorrhiza of Ha showing mantle (m), Hartig net(Hn) and external mycelium (em); d) plectenchymatous mantle of Ha. e) and f) simple and dichotomous mycorrhizal roots of Lt and close-up. White bars = 500 µm in a) and b); 50 µm in c) and d); 1 mm in e) and f). Laccaria trichodermophora.- The ramification type was absent or dichotomous, cylindrical, 0.9 to 5 mm long and 0.5 to 1 mm in diameter. The unbranched tips were sinuous with distal cylindrical ends. In juvenile stages, the ectomycorrhizal roots were brown in color with light brown tips, in mature stages they turned brown or dark brown in color. The mantle presented good visibility, the texture of the surface was smooth to slightly cottony. It presented scarce emanating hyphae with contact exploration type according to Agerer (2001). Rhizomorphs and sclerotia were absent. The external and internal anatomy of the mantle was plectenchymatous. The emanating hyphae were tortuous with a gelatinous sheath. The cortical cells in the transverse section were elliptical, oval or cylindrical. The Hartig net extended into one or two rows of epidermal cells, without reaching the endodermis (Figures 1 e-f and 2 a-b). Figure 2 Ectomycorrhizae of Pinus pringlei with Laccaria trichodermophora (Lt) and Thelephora terrestris (Tt). a) cross-section of the ectomycorrhiza of Lt showing mantle (m), Hartig net (Hn) and external mycelium(em); b) plectenchymatous mantle of Lt; c) and d) Mycorrhizal roots of Tt, showing rhizomorphs (arrow) and close-up; e) cross-section of the ectomycorrhiza of Tt showing m, Hn and em; and f) Tt plectenchymatous mantle. White bars = 50 µm in a), b) and e); 10 µm in f; 1 mm in c) and d). Thelephora terrestris.- The ramification type was absent or dichotomous, cylindrical and with inflated terminations of 0.5 to 6 mm long and 0.2 to 1 mm in diameter. The unbranched tips were sinuous with inflated ends. In juvenile stages they had brown, yellow, gray or white surface with whitish tips; while in mature stages they showed a brown or dark brown color. The mantle presented good visibility, the texture of the surface was soft and cottony and bright brown. Emanating hyphae were abundant with bright brown in color in young stages, and the type of exploration was of medium distance according to Agerer (2001). Cylindrical or rounded rhizomorphs were observed with hairy margins of brown, yellow or whitish color and presence of clamp-connections. The external and internal anatomy of the mantle was plectenchymatous. The emanating hyphae were slightly wavy and with clamp-connections present. The cortical cells in the transverse section were cylindrical. The Hartig net extended to up to three rows of epidermal cells, without reaching the endodermis (Figure 2 c -f). Molecular analysis. The taxonomic identity of the symbionts identified in ectomycorrhizal roots at the end of the experiment had a phylogenetic affinity of 99 % compared to existing sequences in the GenBank database for Ha, Lt and Tt (Table 6). These kind of analyses allow us to conclusively confirm that the fungi that were inoculated, were able to colonize the root of Pinus pringlei. Table 6 Identification of morphotypes of ectomycorrhizae in Pinus pringlei plants, based on their phylogenetic affinity in GenBank. GenBank a: accession number in GenBank of the sequences of the present work, e: probability of error in the identification, % Id: percentage of similarity between the sequences; GenBank b: accession number in GenBank of the sequences more similar to the samples of the present work. a according to macro and micromorphological characterization of sporomes. Field experiment. Survival.- In the field experiment, it was observed that regardless of the treatment the survival was reduced with time. Ten months after transplantation there was a dramatic difference between inoculated and non-inoculated plants. While in the case of non-inoculated plants 100 % of them died, inoculated plants had a survival rate ranging from 30 to 50 % depending on the inoculated mycobiont. At the end of the experiment, plants inoculated with Ha and Tt showed 50 % of survival, while those inoculated with Lt showed 30 % survival (Figure 3; Figure 4). The Kaplan-Meier model indicates that the survival of mycorrhizal plants, independently of the mycobiont, will remain constant after the year of transplantation and there will be a non-significant minimal mortality (chi-square = 8,197, P = 0.042, Figure 4). Figure 3 Establishment of the field experiment. a) Root-ball of Pinus pringlei (Pp) showing high mycorrhization and abundant external mycelium of Hebeloma alpinum (Ha); b) Growth differences between non-inoculated and inoculated plants with Ha; c) local person planting Pp plants inoculated with Thelephora terrestris (Tt); d) One-and-a-half year old plant inoculated with Laccaria trichodermophora; e) Two-year old plant inoculated with Tt; and f) Twenty-two months old dead non inoculated plant. 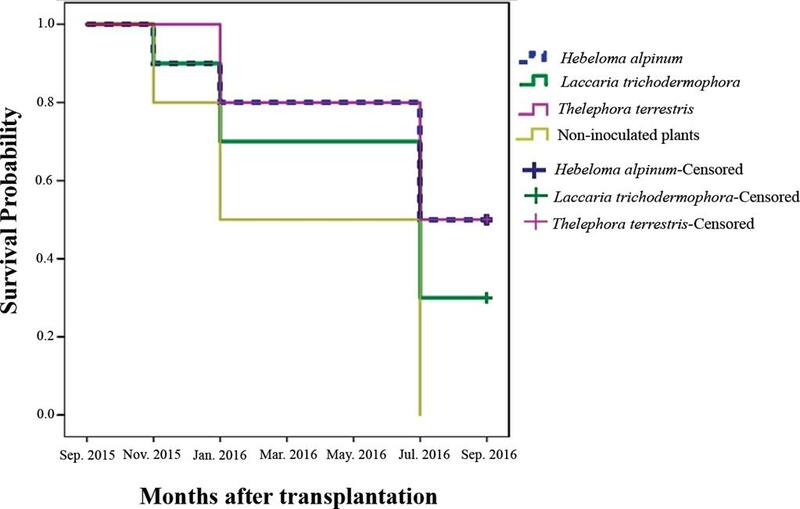 Figure 4 Kaplan-Meier survival estimate for P. pringlei plants inoculated, or no, with three ectomycorrhizal fungi, one year after transplantation. As far as we know, this is the first study evaluating the effect of ectomycorrhizal inoculation on the growth, nutrient content and transfer in Pinus pringlei. It has been shown that the selection of appropriate mycobionts is of paramount importance for the adaptation of forest species in the field (Aggangan et al. 2013). The three inoculated fungi showed a beneficial effect, in terms of growth, compared to non-inoculated plants in P. pringlei. Previously, beneficial effects in terms of growth have been also reported by inoculating pines with different species of Hebeloma, Laccaria and Thelephora. For example, Pinus banksiana inoculated with L. bicolor, L. proxima, H. cylindrosporum and T. terrestris (Browning & Whitney 1991); Pinus sylvestris inoculated with T. terrestris (Bending & Read 1995); Pinus patula inoculated with L. laccata and T. terrestris (Sudhakara-Reddy & Natarajan 1997); Pinus pinea inoculated with H. crustuliniforme and L. laccata (Rincón et al. 2001); Pinus contorta var. latifolia inoculated with T. terrestris (Karst et al. 2009); Pinus patula and P. hartwegii inoculated with Hebeloma sp. and Laccaria sp. (Perea-Estrada et al. 2009); Pinus pseudostrobus and P. patula inoculated with H. alpinum, H. mesophaeum, H. leucosarx, L. laccata, L. bicolor and L. proxima (Carrasco-Hernández et al. 2011); Pinus ponderosa inoculated with H. mesophaeum (Barroetaveña et al. 2012); Pinus greggii inoculated with H. mesophaeum (Martínez-Reyes et al. 2012) and L. laccata (Méndez-Neri et al. 2011), inoculated with L. laccata, L. bicolor and H. leucosarx (Rentería-Chávez et al. 2017). The importance of ECMF for the acquisition of soil nutrients has been previously documented (Smith & Read 2008, Siddiqui & Kataoka 2011, Garcia et al. 2016) and has been demonstrated nutrient acquisition is considered to be a major factor associated with improved seedling growth (Steinfeld et al. 2003). Several studies with other pine species have shown the increase of some macro- and micro-nutrients in their tissues as a consequence of the inoculation with ECMF (Garcia et al. 2014, Zong et al. 2015, Rentería-Chávez et al. 2017). Similarly, in the present work a higher content of macro- and micro-nutrients were recorded in inoculated P. pringlei plants with any of the three evaluated mycobionts. Ha increased mainly Cu and Zn contents; Lt increased Mg; and Tt all macro-nutrients, mainly K, and the micro-nutrients Fe and Mn. Nutrients such as Cu, Fe and Zn are relatively immobile, however the ECMF strongly influence their absorption (Marschner 2012). K+ is one of the most important macro-nutrients for the plant growth and can constitute up to 10 % of the dry biomass (Garcia & Zimmermann 2014). It has been shown that as soon as K+ reserves are depleted in the seed the plants die (Barker & Pilbeam 2015). The maintenance of a high concentration of K+ in plant cells is vital for different physiological processes, such as cell turgor, growth, osmoregulation, stomatal regulation (Adams & Shin 2014, Martineau et al. 2017), promotion of lateral root growth (Armengaud et al. 2004), activation of several enzymes related to proteins and starch synthesis and control of respiratory and photosynthetic metabolism (Marschner 2012). Jentschke et al. (2001) showed that in Picea abies, 5 to 6 % of the total uptake of K+ was carried out by the mycelium of Paxillus involutus. Garcia et al. (2014) demonstrated in P. pinaster that the ectomycorrhizal inoculation with H. cylindosporum strongly improved K+ acquisition under conditions of low availability of this element. Other studies have shown that rhizomorphs from Rhizopogon (Wallander & Pallon 2005) and Suillus granulatus (Wallander et al. 2003) are K+ accumulators, thus contributing to their transport to the roots. In H. cylindrosporum and Laccaria bicolor hyphae (Corratgé et al. 2007, Corratgé-Faillie et al. 2010), genes encoding transporters of this element have been identified. In general terms, there are few studies that demonstrate the micro-nutrient translocation by the ECMF to the host plant. This study demonstrated the efficiency of the three studied ECMF to translocate micronutrients from the substrate to the roots of P. pringlei plants, mainly Fe and Zn; and later on these nutrients were mobilized by the mycorrhizal plants towards their shoots. Fe2+ is one of the most limiting elements in nature, however it is essential for cell growth (Marschner 2012). In plants, Fe2+ is involved in the chlorophyll synthesis and is necessary for the conversion of atmospheric NO3 and N2 in available forms that can be used by plants. Fe2+ also involved in the transportation of electrons in both photosynthesis and respiration processes. Additionally, Fe2+ is not removed from mature leaves to the young ones, so when there is deficiency of this element the young leaves show intervenal chlorosis (MacAdam 2009). In general, there are very few studies that demonstrate Fe2+ mobilization by ECMF in gymnosperms. Leyval & Reid (1991) showed that under conditions of Fe2+ deficiency in the substrate, Pinus elliottii inoculated with Pisolithus tinctorius improved iron absorption compared to non-mycorrhizal plants. However, under sufficient Fe2+ conditions there is less absorption of this element by the mycorrhizal roots. Kottke et al. (1998) showed that in Picea abies stands, Xerocomus badius had greater potential to store Fe2+ and Zn2+ compared to other ECMF. Rineau et al. (2008) showed that in natural forest ecosystems L. subdulcis was more effective in producing 100 times more oxalates; and therefore had a greater ability to access iron compared to Xerocomus sp. It has been found that to mobilize Fe2+ the ECMF produce proteins of low-molecular weight which act as chelators, and are called siderophores. For example, the external mycelium of H. crustuliniforme produces siderophores belonging to the group of ferricrocines (Van Hees et al. 2006, Rineau et al. 2008). Zn2+ is an essential catalytic and structural component of many enzymes, particularly those involved in the transcription process. A deficiency of Zn2+ interferes with stem elongation of dicotyledonous (MacAdam 2009) and uncontrolled access originates the production of dysfuncional proteins and enzymes (Leonhardt et al. 2014). The effect of ECMF for Zn2+ absorption and distribution depends on the fungal species involved and the Zn2+ external concentration. Bücking et al. (1994) demonstrated that Suillus bovinus under conditions of Zn2+ deficiency in the substrate, induced a high translocation of this element from roots to shoots of P. sylvestris, compared to high external conditions of Zn2+. Zong et al. (2015) showed that Pinus densiflora inoculation with Pisolithus sp., Cenococcum geophilum and L. laccata inhibited Zn2+ accumulation in shoots under high conditions of this nutrient in the soil. The ECMF have the ability to generate mechanisms to protect forest tree growing under high Zn2+ conditions, through: i) compartmentalization, ii) intracellular and extracellular complexation and iii) chelation (Leonhardt et al. 2014). For example, H. crustuliniforme in association with Picea abies is able to Zn2+ sequestration in the cell walls of the mantle hyphae and the Hartig net; and stores this element in cytoplasm and vacuoles of fungal tissue (Frey et al. 2000). In Russula atropurpurea there are cyclic peptides that chelate Zn2+, mainly cysteine-rich metallothioneins, two peptides capable of sequestering this element in the sporomes called RaZBP1 and RAZBP2 (Leonhardt et al. 2014) and two Zn2+ transporters called RaCDF1 and RaCDF2 (Sácky et al. 2016). Additionally, Zn2+ transporters have been found in the external mycelium of H. cylindrosporum and T. melanosporum (Bolchi et al. 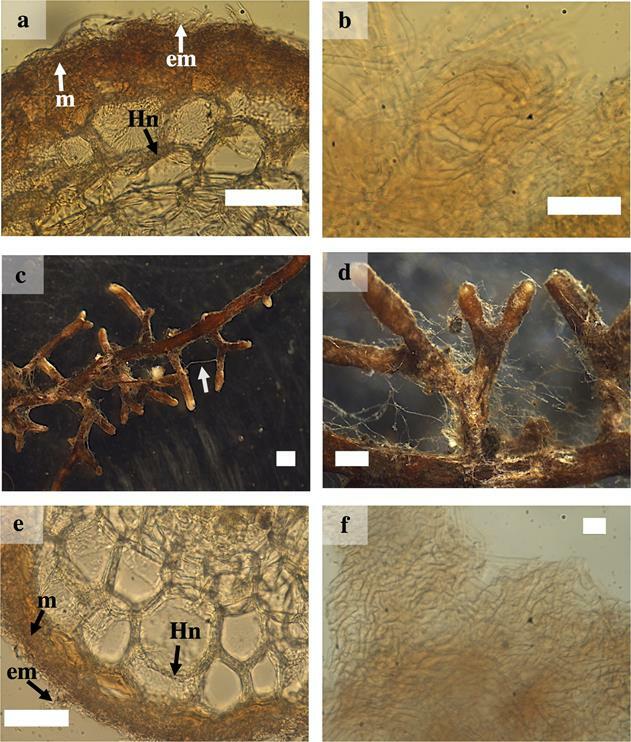 2011) and in the external mycelium and sporomes of H. mesophaeum (Sácky et al. 2014). Strongly positive correlations between macro and micronutrients were found in the present work, mainly in mycorrhizal plants compared to non-mycorrhizal plants. Previously, it has been reported that different nutrients establish these kind of correlations, i.e., it is well known that in general N plant contents are strongly positively correlated with the levels of K, Ca and Mg (Sillampää 1983, Jones et al. 1991). However, despite its importance, as far as we know studies related with how the nutrient correlations are affected by the ectomycorrhizal symbiosis is currently lacking. Our seminal results showing that ectomycorrhiza is a factor that influence the correlations among nutrients highlight the importance of further studies. The percentages of colonization found in the present study were very high, ranging from 96 to 98 %. Which is an important factor in determining seedling vigour and, consequently, plant quality in ectomycorrhizal plants (Smith & Read 2008). The lack of ectomycorrhizal associations in the root systems of trees is one of the main reasons for the failure to establish and grow forest plantations (Itoo et al. 2013). Similar percentages of mycorrhizal colonization have been previously reported by other authors as being good indicators of the effectiveness of succcesful inoculation, for example: Rincón et al. (2001) found 80 to 90 % in P. pinea with H. crustuliniforme; Jonsson et al. (2001) 95 to 99 % in P. sylvestris with H. crustuliniforme; and Zong et al. (2015) 90 % in P. densiflora with L. laccata. However, lower percentages of mycorrhization compared with those found in the present research have previously been observed, for example: Hilszczanska et al. (2008) found 55 % in P. sylvestris with T. terrestris; Carrasco-Hernández et al. (2011) 53 % and 52 % in P. patula and P. pseudostrobus with H. alpinum, respectively; Barroetaveña et al. (2012) 11 % in P. ponderosa with H. mesophaeum; Sousa et al. (2012) 50 % in P. pinaster with T. terrestris; and Rentería-Chávez et al. (2017) 30 % in P. greggii with L. bicolor, L. laccata and H. leucosarx. The morphological and anatomic characteristics of ectomycorrhizal roots allows us to differentiate among the fungal morphotypes involved (Agerer 2006). However, in general, the morpho-anatomical description of Neotropical ECMF has received little attention. Currently, both morpho-anatomical characterizations and molecular analysis are necessary for identification of the mycobionts in the ectomycorrhizal morphotypes (Horton & Bruns 2001). Mycorrhizae of P. pringlei with Ha are similar to those described by Carrasco-Hernández et al. (2015) with P. patula and P. pseudostrobus, except for some differences in branching pattern, color and size. Morphotypes of P. pringlei with Ha do not present a type of tetrapodial branch; in their juvenile stage are whitish at the tip; they have a diameter of up to 1 mm of thickness; and they present abundant emanating hyphae cream to whitish. The type of exploration mantle was of short distance according to Agerer (2001). The mycorrhizae of P. pringlei with Tt are similar to those described by DEEMY (2017) and Mohan (1993), except that in our case they are thicker (up to 1 mm in diameter); sinuous rather than straight; the unbrached tips have inflated and yellowish pale ends and they have abundant light brown emanating hyphae in the juvenile stages. In the case of L. trichodermophora, to our knowledge this is the first description of the morphotype with pines. The inoculated plants with any of the three inoculated ECMF had better plant quality according to Dickson quality index compared to non-inoculated plants. Despite the fact that the plant quality indices are not conclusive parameters of survival under field conditions, due to environmental complexity, plant quality are indicators of desirable morphological and physiological attributes and frequently also health and genetic characteristic, which influence the plant survival and development in the field (Villar 2017). In the present work the inoculation with ECMF was of significant importance for the survival of P. pringlei plants transplanted to field. It has been previously reported that ECMF are able promote survival, establishment and growth of seedlings into the field in newly established (Turjaman et al. 2011), and especially in highly disturbed sites (Sanchez-Zabala et al. 2013, Simard et al. 2012). Previously, it has been demonstrated that fungal mantle acts as a physical barrier that prevents water loss and root drying (Smith & Read 2008) by exploring in large soil volumes to water and nutrients access for their associated host (Pérez-Moreno & Read 2004). Therefore, ectomycorrhizal inoculation in plant production in nurseries is a key factor for reforestation or the establishment of successful plantations. Previous studies have shown that ECMF increase field survival in pines: Pinus ponderosa presented 41 to 93 % survival when inoculated with Rhizopogon rubescens (Steinfeld et al. 2003); Pinus halepensis inoculated with Rhizopogon roseolus and Suillus collinitus, had a survival rate of 16 to 77 % (Rincón et al. 2007); P. densiflora inoculated with Pisolithus sp., C. geophilum and L. laccata after six months of transplantation had 50 % survival in contrast to 6 % of non-inoculated plants (Zong et al. 2015). In general terms, the evaluation of field survival in Neotropical pines inoculated with native fungal species has received little attention despite its importance, since exotic mycobionts or commercial inoculants have been generally used. Among the plants inoculated with the evaluated mycobionts there were strong differences in terms of field survival. The plants inoculated with Tt and Ha had a survival rate of 50 % and those inoculated with Lt only registered 30 %. This could be related with the exploration type of their hyphal systems. The type of exploration of the external mycelium of Ha is short and that of Tt is medium, in comparison with Lt which has a contact exploration type. Additionally, Tt presented abundant rhizomorphs. Previously, it has been pointed out that rhizomorphs are hyphal strands which act as functional extensions of roots (Pérez-Moreno & Read 2004), and play a crucial role in the storage and transport of water to the host plant over great distances. Cairney (2005) and Brownlee et al. (1983) pointed out that some hyphae that form rhizomorphs can lose their transverse walls and thus form large vessels which mobilize significant quantities of water and nutrients. Plants inoculated with fungi that form rhizomorphs such as Tt are more tolerant to drought than those mycobionts without rhizomorphs like Lt, and non-mycorrhizal plants (Parladé et al. 1996, Duddridge et al. 1980). The slow release of water from rhizomorphs to the plant under drought, conditions could mitigate the water stress (Steinfeld et al. 2003) and thus substantially contribute to the survival of trees in field conditions (Lehto & Zwiazek 2011). The present work demonstrates the high potential of Ha, Lt and Tt as useful sources of ectomycorrhizal inoculants for the production of high quality P. pringlei plants. In addition, Ha and Lt constitute a non-timber forest resource with great cultural, social and economic importance in Central Mexico, as they are frequently used as food (Pérez-Moreno et al. 2010, Montoya et al. 2014, Carrasco-Hernández et al. 2015). In the case of Tt although it has not been registered as an edible species, the genus includes Thelephora gambajun, which has a high food and medicinal value in China due to its antioxidant properties and high content of aminophenol used in production of paracetamol (Mortimer et al. 2012, Xu et al. 2016). Therefore, the evaluated ECMF showed a great biotechnological potential in the production of P. pringlei, a native species from Mexico with great forest possibility use. The first author acknowledges CONACyT for the financial support of his Master's degree in Science scholarship number 1143005. In addition, it is acknowledged the financial support of the project CONACyT-24667. The authors also thank two anonymous referees and the Editor whose valuable comments helped to substantially improve the original manuscript. * Corresponding author: Jesús Pérez-Moreno, e-mail: jperezm@colpos.mx. Author contributions: Araceli López-Gutiérrez designed and set up the experiment, evaluated and analyzed data and wrote the paper. Jesús Pérez-Moreno designed the experiment, analyzed the data and helped to write the paper. Faustino Hernández-Santiago designed the experiment and carried out molecular analysis. Ebandro Uscanga-Mortera designed greenhouse experiments, critically reviewed first drafts of the paper and helped with interpretation of the data. Antonio García-Esteva helped with the paper writing and critically reviewed the interpretation of the data. Víctor Manuel Cetina-Alcalá analyzed data and designed greenhouse and field work. María del Rosario Cardoso-Villanueva carried out molecular analysis and reviewed final manuscript. Beatriz Xoconostle-Cázares carried out molecular analysis and helped with data analysis.